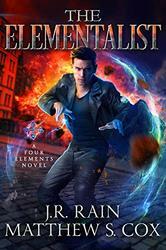 First in the brand-new "Four Elements" series of supernatural mysteries, by #1 bestselling authors J.R. Rain and Matthew S. Cox! In a small town where people go missing all the time, one might think a private detective would have no trouble finding work. Except for Max Long. His luck really is that bad—at least until a blonde bombshell shows up with a missing sister. She might be good luck, or more likely, entirely the opposite. Drop-dead gorgeous women aren't exactly common in Shadow Pines, nor do they walk into his office. Everyone in town knows there's something unusual about the place. The excuse of animal attacks claiming the unwary hiker works only so long before a rational person suspects the irrational. Blood stolen from the hospital, strange howls at night, and a girl with an overly innocent face that spells trouble all lead to one conclusion: Max is in way over his head. The night after a strange meteorite streaked across the sky, the wind responds to his desires. He soon discovers he can manipulate water, fire, and earth as well. Shadow Pines is out of balance, and Mother Nature has sent Max to fix it.